These cards are currently on sale as a fundraiser for BCR and make PURRFECT gift. During my 2nd semester at Antonelli Institute we had an assignment in our photo journalism class to give back to a non-profit organization. I heard about Brenda's Cat Rescue from my teacher. I had to jump on it, because anyone who know's me is aware I LOVE CATS. I contacted Brenda to photograph an adoption event she was having on Germantown Ave in Philadelphia. She was super friendly and the cats were just adorable! 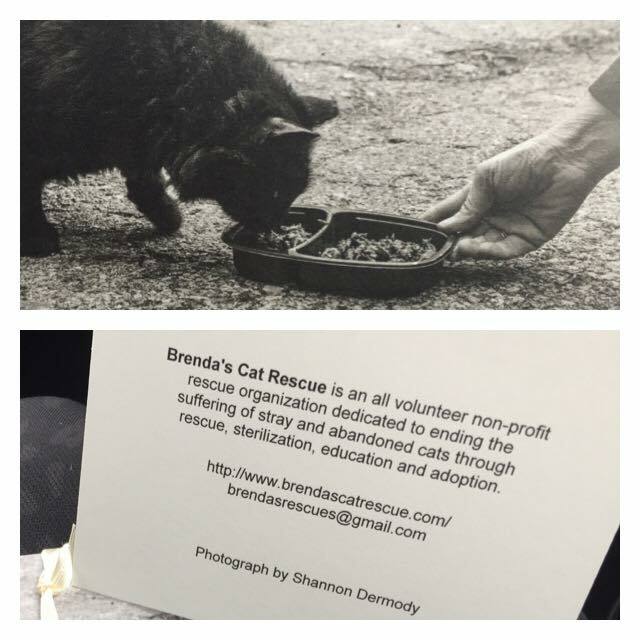 What Brenda does is with small group of volunteers and completely self-funded,she rescue's stray and abandoned cats around the area of Philadelphia. She provide's the vet care, and work to find them all an amazing loving home. It is just so sad for these cats. Cats that were abused, hit by cars etc. I loved photographing for Brenda. I went on a 'Trapping' ride with her one day, to rescue the poor cats we found. We went back empty handed but I learned so much and the process of trapping. It is hard work. We did come across a few cats in a apartment complex parking lot, where the cats were so scared they would just run away. Brenda went to her car grabbed a few dishes and food an began to feed them. They came around but would run with any sudden movement. During this time I captured the photo you see to your left. Brenda had this printed on notecards! It was such an honor! I want to help Brenda out as much as I can. She is doing such an amazing thing! If you want to help I linked her website below, where you have the opportunity to donate (every penny counts), and learn more about Brenda's Cat Rescue!